Welcome into “my world”. We all share the same universe and life support of our planet Earth, yet seem to perceive that reality in different ways. For many decades I was simply a world executive with large hierarchical responsibilities. I was career, status and income driven, with no other awareness than that this was “normal”. This changed in phases when I had to make personal and professional decisions involving significant and extreme moral issues. The awakening was further triggered by important moments of personal chaos. Letting go of previous sense of security got me to enter a vaccuum in which I was to encounter my own true self and meaning. What was normal before became abnormal and vice versa. The worldview turned upside down. The enlightenment is often sold as pleasing and lovable. In reality it is a very and intensely disturbing feeling until one reaches the deepest spiritual layers where peace of heart and mind reigns and purpose breaks through. My move back to Holland after 27 years of absence opened up my mind further, this time to changing realities at societal level. I call my discoveries the “natural cyclic complexities”. My own awakening and the perception of evolving human system complexities made me develop my own views of the ideal society. 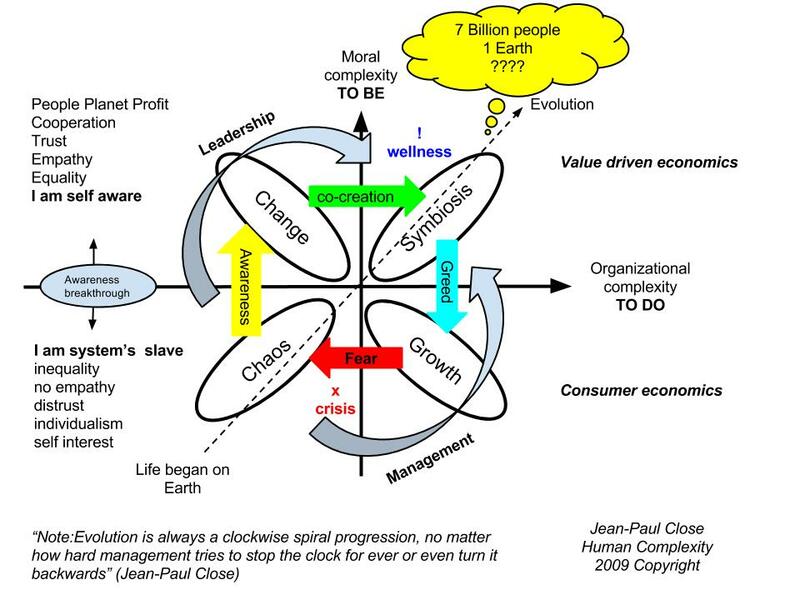 Normal and abnormal became the same within the cyclic nature of our evolution seen from a holistic point of view. The picture below says it all. It has taken me 14 years to figure out and reflect the entire human complexity into a helpful picture. Despite the simplication in the drawing only a very small minority understands. Now I am priviliged to see the whole picture. This is not very comforting because I can see and care about the many patterns in human society and all the consequences. The real comfort I now find in realizing that it is all part of a bigger reality called “nature”, “life” and “universe”. This contains “life” as a continuous universal value that repeats itself over and over. Paradoxally one big meteorite can eliminate us instantly. On the other hand, we can do too and are already denominated to be the 6th overall life eliminating disaster since the creation of our planet after the Big Bang. Nevertheless, the human condition of true self awareness is extremely rare in the universe and too valuable to be eliminated through our own blind irresponsibility and greed. We should never feel relieved from our responsibility to use our self awareness properly simply because so many are still unaware. We should help those who try to survive by creating conditions for them to live the miracle of a conscious life too. 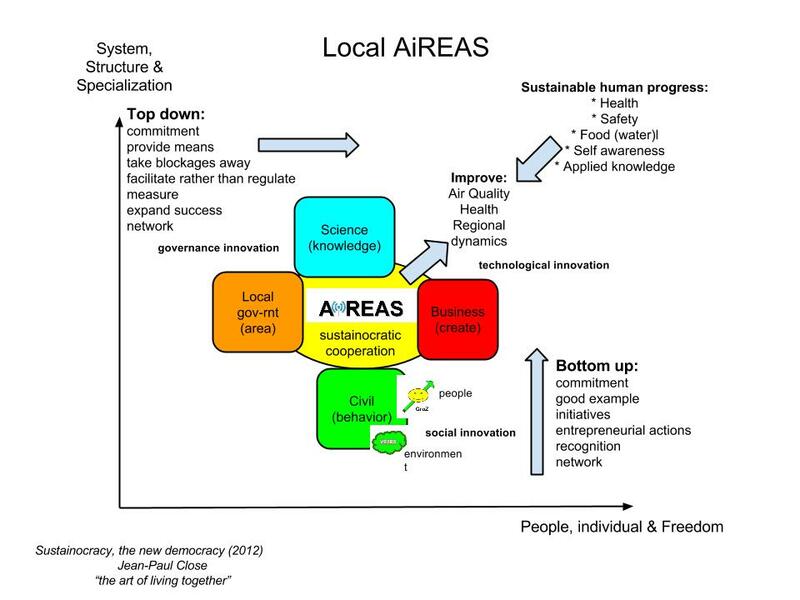 My world therefor develops in the field of “leadership”, moral values, purpose driven co- creation and symbiosis. The new emerging democratic society I called “Sustainocracy”. Can evolutionary human progress be made when we seem to be ruled by managing bureaucrats and fake money driven immorality? I believe it can, by combining the best of both real worlds (leadership and management) into truly holistic ventures. With this I have been experimenting since 2009 with very promising results. You are welcome to participate. Natuurlijk herinner ik mij jou en onze avonturen. Mijn turbulente leven is de basis voor wat ik nu doe, hetgeen nogal confronterend is met de huidige maatschappelijke structuur. Ik heb het redelijk publiek gemaakt zodat men inziet dat mijn drijfveer ook onderbouwd is. Rust heb ik er zeker door gekregen maar ook een innerlijke drang om het bewustzijn te benutten dat ik heb opgedaan door de intense keuzes die ik heb moeten maken. Het heeft mij een beetje inzicht gegeven over zaken die wij nu wereldwijd “crisis” noemen en de betekenis ervan. Een mooie uitdaging voor deze fase van mijn leven. Natuurlijk ben ik benieuwd hoe het jou is vergaan na al die jaren (25 jaar geleden nu)? Misschien is dit niet de plek om daar over uit te wijden. Mijn email is jp@stadvanmorgen.com en telefoon 0654326615.
blogs on the web. I am going to recommend this site!